You can make our delicious Chocolate Peanut Butter Eggs to serve as dessert, or as a quick treat to enjoy over the long weekend. Although they scream Easter, we aren’t above making these all year round, they’re so good! These Chocolate Peanut Butter Eggs are easy to make and require very few ingredients. They come together so quickly and easily you can’t really go wrong. 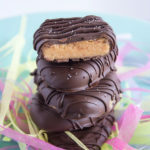 These treats taste kind of like a Reese’s Peanut Butter Cup, but better because they are vegan! The recipe doesn’t call for it, but feel free to add a teeny tiny sprinkle of sea salt just before the chocolate sets for a slight twist. We’ve tried it and, it’s pretty darn tasty. You can even get real creative and pipe some decorations onto the eggs using melted chocolate. It’s not necessary but it would make for a cute dessert plate. It’s Easter so we say get creative and eat lots of chocolate! Oh and by the way… they pair real nice with a glass of red wine! Just saying! If you want more peanut butter, chocolate-y goodness, make a batch of our Peanut Butter Brownies! In a medium bowl mix together the almond flour, peanut butter, maple syrup and vanilla until fully combined. The mixture should start to resemble a thick dough. If the dough is to soft and more almond flour, 1 tablespoon at a time. Measure out 1 tablespoon of dough and using slightly wet hands, shape the dough into egg shapes approximately 1 inch in thickness. Place peanut butter shaped eggs into the freezer and allow them to harden, approximately 15 minutes. Meanwhile add chocolate to the top pot of a double broiler and melt completely. Once the peanut butter eggs have hardened, dip them in the melted chocolate until completely covered. Place eggs back in freezer and allow the chocolate to harden, approximately 10 minutes. Once the chocolate has hardened, remove from freezer and drizzle on more chocolate for design. 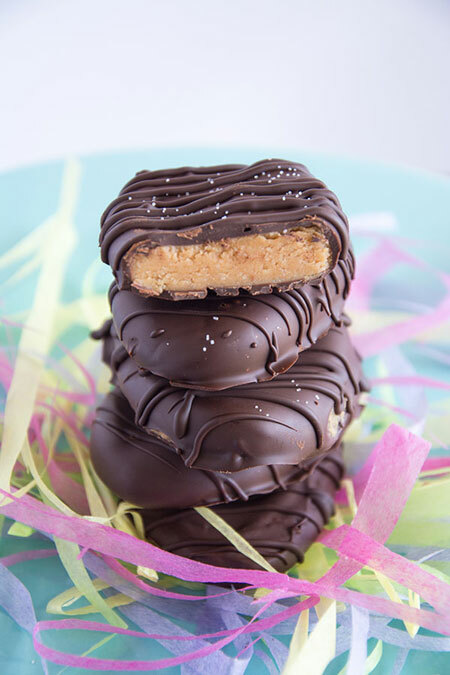 Place chocolate peanut butter eggs back in freezer until chocolate has completely set. *Store eggs in fridge the chocolate melts easily.